Astronomers Identify Two New Solar Systems One of the new systems has two planets; the other has as many as seven. Though these planets aren't the type that can support life, scientists say detecting planets that can is looking very likely. In the field of astronomy these days, it's raining planets. Two leading teams of planet hunters announced this week that they'd found entire solar systems -- one with two or three planets, the other with as many as seven. These are not planets where life could actually survive, but many scientists say that detecting planets that can is looking very likely. Matthew Holman, a scientist at the Harvard-Smithsonian Center for Astrophysics, was one of the scientists playing top-this at a conference hosted by the Observatoire de Haute-Provence in southeastern France. "There's always, I admit, an element of competition," Holman says of the conference. "People come and want to show their best work and surprise their colleagues." Holman had to keep his own surprise under wraps for a few days because it hadn't yet been published. So he just listened as his European competitors claimed the spotlight. Christophe Lovis, from the University of Geneva, announced on Tuesday that his group had discovered a whole collection of planets orbiting a star 127 light-years away. "At least five planets, and probably seven," Lovis said. "Two of them are a little bit uncertain." That makes it the largest solar system ever seen outside our own. But Lovis didn't actually see any of those planets -- that's impossible right now. But Lovis did watch stars -- very carefully -- as they move through space. If they speed up and slow down a little in a regular pattern, it indicates that there's something tugging on them: the gravitational pull of an orbiting planet. This has been the most successful planet-hunting technique, but it works best for giant planets close to small stars. Of the 500 planets discovered so far, most have been like this. One of the new planets that Lovis announced, however, appears to be much smaller -- its mass is just 40 percent greater than that of Earth. "We've really moved from giant planets only to any kind of planetary system, with more and more planets, small-mass planets and so forth -- it's really exciting," Lovis says. Thursday, Holman finally got to add his bit of excitement when his discovery was published by the journal Science. 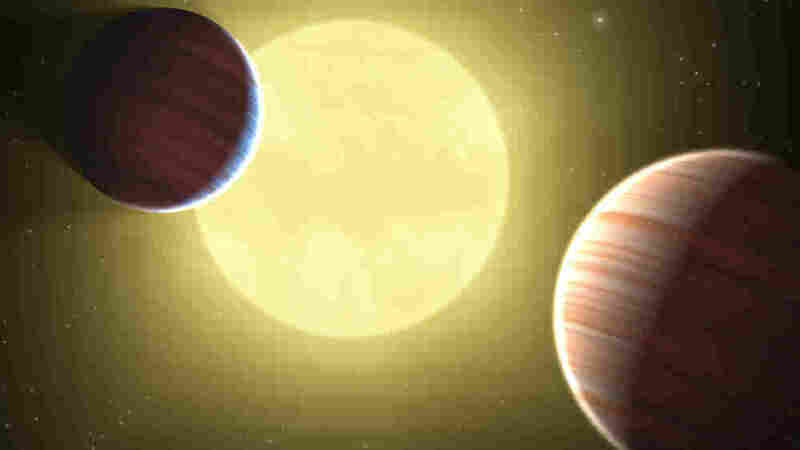 "We're announcing the discovery of two Saturn-size planets, which we're calling Kepler 9B and Kepler 9C," Holman said. And there's evidence of a third planet, he said -- a much smaller one. Its diameter appears to be just 50 percent larger than Earth's. "If it is confirmed, it would have a radius of about 1.5 times the radius of Earth." Holman's discovery, in fact, is an early scientific harvest from NASA's new planet-finding machine -- a telescope called Kepler. This instrument is following Earth in its orbit around the sun, staring constantly at a group of 100,000 stars in another corner of our galaxy. When the light from any of those stars dims slightly, it's evidence that a planet just crossed in front of it. The planets that scientists have found so far are not habitable -- the small ones are way too close to their stars. But Kepler was designed specifically to detect planets just like Earth. And Alan Boss, an astrophysicist at the Carnegie Institution of Washington, is increasingly confident they're out there. "We're finding more and more evidence that Earth-like planets are going to be quite common," Boss says. "We don't have them yet, but we're well on the way to discovering them. We will have to be patient, though -- a planet just like Earth crosses in front of its star once a year, and scientists won't declare it a planet until they see the star's light dim at least three times.